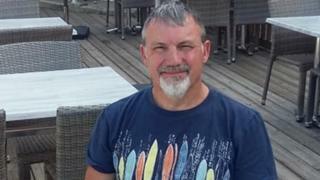 The body of a man, believed to be a missing kayaker, has been found off the Dorset coast, police have said. Alistair Collier, 60, from Worcester, was last seen at 12:00 BST on Saturday at the start of a race at Knoll Beach, Studland. A search was carried out using an aeroplane, helicopter, four coastguard rescue teams and three lifeboats. Dorset Police said a body was found alongside a kayak 22 miles from the shore on Sunday afternoon. Organisers raised the alarm at 13:45 on Saturday when Mr Collier did not complete the race from Knoll Beach to Swanage Pier, prompting a large-scale search of the coast. Coastguard helicopters continued looking for him overnight and a coastguard fixed-wing aircraft was brought in on Sunday morning as the search area widened. Police said the aircraft found the body, which was recovered from the sea by the warship HMS Tyne.